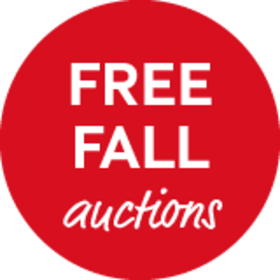 before the auction starts, or try to snap it up for a killer price when the Free Fall begins. The strategy is up to you! Showing 1 - 20 of 20 items. Taking a classic old Cuban brand to a new level, the folks at Altadis USA have created a real premium gem with the Henry Clay Stalk Cut Gran Corona. To create this masterpiece, a top-quality 2012 vintage Connecticut Broadleaf wrapper covers a 2010 Vintage Dominican Piloto binder, and a filler consisting of 2012 Vintage Dominican Olor, 2012 Vintage Dominican Piloto, and 2013 Vintage Nicaraguan Criollo. Full bodied in strength, the smoke delivers satisfying notes of dark chocolate, coffee bean, leather, and spice. 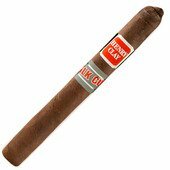 Henry Clay Stalk Cut Corona comes packaged in steel gray boxes holding 20 of these luxury cigars. 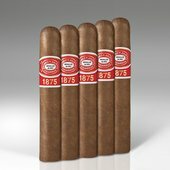 This buxom little Bully is the most popular size in the Romeo y Julieta 1875 line. Packaged in packs of 5, this feisty Robusto is covered with an oily brown TBN java wrapper, Dominican binder, and choice filler tobaccos from the Dominican Republic and Brazil. This tasty, medium bodied, anytime of the day smoke offers the perfect balance of nuts, earth, and sweet spicy flavors. Our amazing Blast From The Past Monte-Juli-Nudo Collection features 15 cigars from three of the most famous cigar brands in the industry. 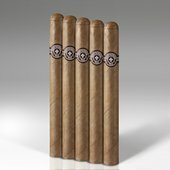 You get five cigars each from the time-honored Montecristo, Romeo y Julieta, and Macanudo lines. A fuller bodied take on the original Monte blend, the Montecristo Platinum Series Toro is a bold masterpiece brimming with earthy, sweet, Cuban-style goodness. Moving down a notch in strength, the classic Romeo y Julieta Reserva Real Robusto is a medium body cigar beloved for its rich nutty flavors, top-notch construction, and a luring sweet aroma. A brand that needs no formal introduction, the famous Macanudo Hyde Park has been nourishing the needs of mellow cigar aficionados since 1971 with its smooth coffee, sweet spice, and creamy caramel flavors. All these timeless premium gems are available for one very reasonable price, so order yours today before they are all gone! 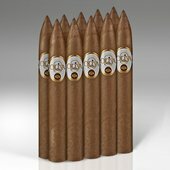 Cuban Rounds Churchill cigars are Nicaraguan puros made with a short filler blend of aged Cuban seed tobaccos. It’s a medium to full body smoke with spicy and peppery top notes backed by nuances of coffee, chocolate, and cream, that combine to offer a satisfying and affordable every day cigar. The Odyssey Connecticut Robusto cigar is a mellow to medium body blend made with aged Nicaraguan binder and fillers, topped with a smooth, creamy, Connecticut wrapper. The affordable price, and lush flavors of caramel, roasted nuts, sweet spice, and coffee, make it an ideal every day smoke that won’t put a dent in your budget. The Friendly Rivalry Collection speaks for itself. Made up of 18 popular and sought after smokes from famous cigar-makers such as Romeo y Julieta, Macanudo, and La Gloria Cubana, each smoke within this collection will have a friendly rivalry on which one to capture your attention first. 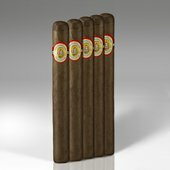 Available for just a limited time online, get this affordable collection with highly-rated smokes today at JRCigars.com! One of the smaller sizes in the world famous JR Ultimate line, the Habanito smokes like a big cigar. A beautiful Connecticut Broadleaf wrapper and binder cover choice filler tobaccos from Honduras. 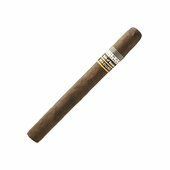 Its zesty Cuban style flavor and intense musky aroma will satisfy your cravings when you crave a fine smoke but are pressed for time. Sold in boxes of 24. Montecristo cigars, the world's most famous cigar marquee, originated in Cuba in 1935. The tradition of Montecristo excellence continues today with skilled artisans in the Dominican Republic, and the Montecristo Churchill is a shining example of that skill. This big mild to medium-bodied smoke offers the rich, smooth, and well-balanced flavors that loyal fans of this brand have come to depend on on for many decades. The Churchill is available in packs of 5. Please note: Sizes do vary for these cigars and may not match the size specified on the website due to the fact that they are overruns. 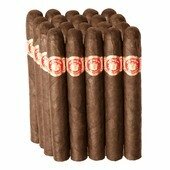 The Nicaragua Factory Overruns Churchills are made by one of the famous, top-selling cigarmakers in the industy but since they are amazingly priced, we cannot say the name or the blend. 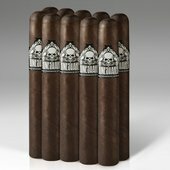 What we can say is that they are impeccably-crafted with the best aged tobaccos. They are considered medium to full body in strength and are bursting with rich, Cuban-style flavor within a dark habano wrapper. 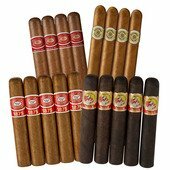 Compare these very affordable 20-count bundle smokes to some of your favorite super-premium sticks and you will quickly realize that these 7x48 no-name treasures can just easily match them! What's the difference? The price. José “Pepin” Garcia first produced my Father Vegas Cubanas Delicias cigars in 2003 in a small factory in Miami’s cigar rich Little Havana neighborhood. After a long hiatus, these elegantly boxed and banded cigars are back and just as good as ever! They are now hand rolled in the Garcia family’s state of the art facility in Nicaragua with the original blend of Nicaraguan binder and filler tobaccos from the Estelí and Jalapa regions, cloaked inside an undisclosed wrapper. Once lit, you will experience the bold, classic, Cuban-style flavors of spice, nuts, leather, and coffee, that made My Father one of the hottest names in the premium cigar industry. 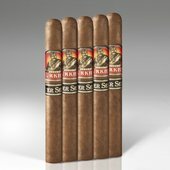 The delicious Gurkha Master Select Toro 5-pack cigars have a dark and silky, Dominican-grown Habana 2000 wrapper resting on top of carefully aged filler and binder tobaccos grown in the Dominican Republic, and Honduras. Notes of cocoa, chocolate, almonds, and nuts, with a subtle spicy core become more complex and flavorful as the cigar is smoked. No.625 is a classic Lonsdale with a creamy smooth flavor and tasting notes of almonds, cocoa and caramel. Amazingly solid construction and a very affordable price make this beauty, in Cedar Chests of 20, an absolute steal! Medium bodied in strength and loaded with sweet nutty flavors, The H.Upmann Crown Imperial is a beauty to smoke. Individually wrapped in aromatic cedar sleeves to further age and enhance its flavor and aroma, the Crown Imperial is a delight to smoke. Packaged in a pack of 5. Pita is one of the most popular sizes that Punch has to offer. This Toro in Maduro has a stunning Connecticut Broadleaf wrapper, giving it the bold rich and spicy flavors that fans of this brand thoroughly love. Packaged as a pack of 20. 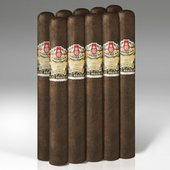 In packs of 5, the Las Cabrillas Balboa is a value priced beauty brimming with lush sweet and spicy flavors. A dark, thick, and oily Connecticut wrapper sits on top of perfectly aged all Mexican binder and filler tobaccos. The fabulous earthy taste and fragrant smoky aroma is sure to win you over.